Peterborough’s vibrant cultural community offers a wonderful array of choice. 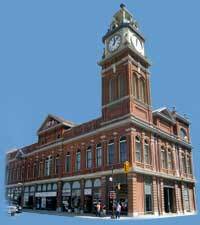 Market Hall supports the city’s signature structure, a newly restored clock tower that dates back to 1890. 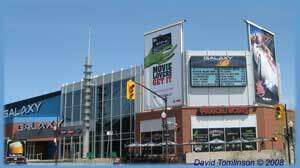 The modern Galaxy Cinema complex, located in Peterborough Square, is adjacent to Market Hall and together, they present a fine example of the old and the new coming together to promote a vibrantly active downtown core. The century-old Market Hall is a cherished venue for local performing arts groups while Galaxy Cinema houses eleven screens showing the all latest Hollywood movies. Other venues include the Theatre Guild’s own Guildhall performance space, the Gordon Best Theatre, a downtown coffee house and bar that regularly features local performers and Showplace, an ultra modern, 647 seat performance venue for local, national and international music concerts, musicals, dance, and theatre. The Art Gallery of Peterborough is situated on the shore of Little Lake beside Del Crary Park and is home to a collection of over 1,000 pieces. This public gallery presents contemporary art exhibitions and related programs of lectures, workshops, art history studies, films, and publications. Focusing on visual art by Canadian artists from this region, some historical and international work is also shown. Holding a ‘Class A’ rating as a collecting institution, the Peterborough Centennial Museum and Archives offers interactive educational programs ranging from pre-school to university levels. Exhibitions draw upon the 25,000 artifacts, objects, documents and photographs featured in its collection, which is the second oldest in Ontario. The annual ‘Muse’ film series, out door theatre presentations, astronomy programs and lectures round out the Museum’s commitment to programs for both children and adults. The Canadian Canoe Museum presents exhibitions and interactive programming drawn from its unique collection of over 600 canoes and kayaks plus over 1,000 related artifacts. The museum location is significant to Peterborough’s heritage as the birthplace of the modern canoe and hub of canoe manufacturing from 1850 to 1960. With the establishment of the Peterborough Canoe Company, this factory manufactured and exported wooden canoes bearing the Peterborough name, throughout the world. In 1948, the citizens of Peterborough presented a ‘Peterborough Cedar Rib Canoe’, as a wedding gift, to Princess Elizabeth, the future Queen. The Peterborough Symphony strives topresent the most enjoyable concert experience for both audience members and musicians. Concerts presented at Showplace include a repertoire ranging from classical to pops plus an occasional premiere of newly commissioned work. Programs feature soloists recognized both nationally and internationally while promoting the 60 exceptional volunteer members of this community orchestra. The Peterborough Singers presents an annual Concert Series that features world-class Canadian soloists. With over 100 members, this highly regarded ensemble performs a repertoire that includes gospel, sacred, pop, oratorio and newly commissioned work. Formed in 1992, under the direction of Syd Birrell, the choir celebrated its 15th anniversary with a performance at Winchester Cathedral in England. Proceeds from sales of this choir’s CD’s have raised $25,000 for cancer research. Peterborough’s active music scene includes Streetfest, afree event in July that closes George Street to showcase live bands and buskers. In August, the three-day Peterborough Folk Festival features live music, workshops, food and craft vendors. The Downtown Jazz Festival and Jazz Restaurant Tour in September is a popular event bringing great jazz and blues music together with a diverse collection of venues. The Kawartha Jazz Society, a volunteer organization presents an annual season of five jazz concerts while the Folk Under The Clock concert series, features Canadian and international folk artists. The Peterborough Theatre Guild presents plays in the Guildhall and is the only producing theatre company in the region, which owns its own theatre venue. Peterborough New Dance presents contemporary dance and related forms encompassing theatre, new music and interdisciplinary work. Their ‘Mainstage Series’ features dance companies and independent choreographers from across Canada. This organization also commissions new work and offers specialized classes and workshops and produces a festival in March/April ‘Emergency: Festival of New Dance and Performance by Peterborough Area Artists’. 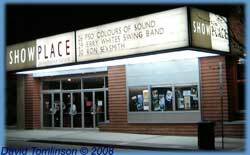 Artspace, one of Canada’s oldest artist-run art centers, was founded in 1974 and maintains a public gallery. Its mandate is to support the growth and development of contemporary artists. The Peterborough Arts Umbrella serves practitioners of all artistic disciplines in Peterborough and surrounding area. The organization maintains a public gallery and operates a media centre, providing resources to members for the production of digitally based audio and video works. The Peterborough Historical Society owns and operates Hutchison House, a living history museum and provides educational tours and events in the1837 stone house at 270 Brock Street. The Society Bulletin is distributed to the 277 paid members, ten times a year. The Society supports historical projects and installs historical plaques at significant sights in and around the City of Peterborough. The Peterborough Public Library has two branches that belong to a borrowing network that shares a database of materials with a group of libraries referred to as PACLAN (Peterborough and County Library Automation Network). The Main Library, located at 345 Aylmer St. North, is a full service library. The DelaFosse Branch houses a collection of approximately 14,000 books for recreational reading and is located in the south end of the city at 729 Park St. South.